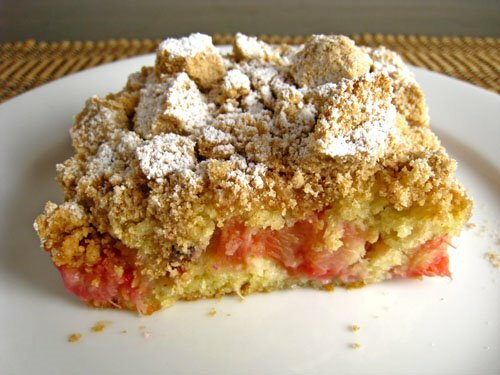 I came across this recipe for a rhubarb crumb cake a while ago. Rhubarb is something that I had been wanting to use more and a cake sounded like a great way to do it. I bookmarked the recipe to save for when rhubarb was in season and now that it was I had the chance to make it. The ingredient list for this recipe is a bit long but the cake comes together easily. The rhubarb crumb cake was really good! The cake was nice and soft and moist and the crumbs were light and sweet. Rhubarb is a bit tart and it perfectly balanced the sweetness of the crumb topping. I admit, I have been eating this cake for breakfast, along with the rhubarb fool. I have been enjoying the rhubarb so far this year and I look forward to using it some more. Toss the rhubarb with the sugar, cornstarch and ginger to coat. Mix the sour cream, egg, egg yolk and vanilla in a large bowl. Mix the flour, brown sugar, sugar, cinnamon, ginger and salt in a large bowl. Mix the butter into the flour mixture. Mix the sour cream mixture into the flour mixture 1/3 at a time mixing in between. Pour all but 1/2 cup of the batter into a greased 8×8 inch baking dish followed by the rhubarb mixture and the remaining batter. Mix the flour, sugar, baking soda, baking powder and salt in a large bowl. Break the topping into big crumbs with your hands and sprinkle onto the cake. Bake in a preheated 325F/170C oven until a toothpick pushed into the center comes out clean, about 50 minutes. This looks wonderful, I’ll have to try it for my rhubarb-loving husband. I recognised this as a Smitten Kitchen recipe straight away – phwoarr. Looks fantastic. I’m a latecomer to rhubarb, but I’ve been looking for more things to do with it. This looks fantastic. Thanks for sharing! Now I am really tempted to rush out and purchase some rhubarb! Another fine creation from Kevin’s kitchen! Yep, we’re both crumby today aren’t we? This looks delicious. I’ve been wanting to try rhubarb (never have!) This looks like a good way to start. That looks delicious. I just bought some rhubarb today at the market. I absolutely love it. Love the tang, especially with strawberries. Way to support the rhubarb. The cake and the fool are both great ideas. I wonder if there is some kind of way to combine them. That would be cool. You know, I’ve never had rhubarb. Really, for no particular reason other than well, I’ve just never had it! This crumb cake inspires me to finally take the plunge. Hi. First time here on ur blog. You do have some great recipes. This cake loooks awesome, Yummyyyy!! !Keep rocking..
That looks like breakfast to me! Your cake looks fantastic, Kevin! I love a good crumb cake and the rhubarb sounds like a great addition. Well done! Now that crumb cake looks delish! I could have that for my breakfast (it’s 8am here) can you send some over please! One of these days I will finally try rhubarb. Your cake looks fantastic! The cake looks awesome. I want some! I confess I used to think rhubarb unimaginably awful. Then, I was converted. Totally. My partner loves it. So, when I recently saw it in a local form, I made a rhubarb compote (with vanilla and ginger) with salmon. Sounds odd but I love it. Mmmm this looks so nice. Rhubarb and crumb cake. A perfect combination. I need to go get some more rhubarb. This looks fantastic Kevin! That looks great, It looks as pretty as I’m sure it is tasty! When you republish a recipe that was created by somneone else, at the very least you should give full credit by name in your post. I expected to see Smitten Kitchen cited and praised for this recipe. When you name your source, rather than just pointing to it, you benfit that source by increasing their search engine optimisation. You need to also make sure that the link contains key words that benefit Smitten Kitchen. I know it’s a brave new world for most of us in blogging land and we all need to learn the rules of kind and legal engagement. That looks yumsious, I lurve rhubarb. It looks perfect!!! The crumb quality looks just superb. Looks great, Kevin! I love rhubarb but I haven’t had a chance to make anything with it myself. I definitely plan on doing that soon. Love rhubarb! So does our dog, she eats our whole plant! Ahhh!!!! It looks like a really great recipe. I’m just confused – did you use 3 different kinds of sugar? how is the granulated sugar different that the other white sugar? Kevin, that’s gorgeous! I’d be having it for breakfast, lunch, dinner and snack time! What an interesting recipe! Looks delish! you don’t post a lot of sweet recipes, but when you do, you sure pick winners. this looks awesome–i’m all about crumb toppings! Lovely recipe Kevin,I have never put my hands with Rhubarb, But this cake sounds delicious and is tempting me to try soon. Thanks for sharing the recipe. Oh gosh Kevin this is one gorgeous cake!! Loverly cake! Love rhubarb, especially in desserts! That’s a very good use of rhubarb. 🙂 YUM. Mmmm.. I love rhubarb! Never thought of it in a crumb cake, but I bet it was delicious. It definitely looks like it was! this looks fantastic. perfect crumb topping and great move on the icing sugar. My partner made this cake, found at Smitten Kitchen, a few weeks ago. We found it good but a little too sweet. The delicious rhubarb was lost. we are going to try it again but tweak it a bit. I’m not a huge rhubarb fan but the crumb on top of this cake looks insanely good! I love that you have baked rhubarb in a good way. I have some issues using it as a baking fruit – but I guess it’s all about balance – I have yet to find it! I think this sounds like the perfect breakfast! i love all sweets with fruit in them…and i love anything w/streusel topping so this is perfect for me!